Today, Torrent has become one of the basic necessities of life, especially for the youngsters. Be it movies, ebooks, videos, TV shows; it is the best place on the World Wide Web for downloading these large files. However, it may sometimes have slow download speed short come. These Torrent Clients use the BitTorrent Protocol, a content distribution protocol that supports peer-to-peer file sharing for a large amount of data distribution. We do not download the required file directly; instead, we first download its .torrent file from various torrent providers like Kickass, Pirate Bay, etc. Technically, the .torrent files contain metadata; what you can say is entire information of its respective large file to be downloaded and not the actual content! The Torrent Clients then use the .torrent file to download and seed the required file by the user. This is the primary step one must take to get their file downloaded fast.When selecting a torrent file, take a glance through the seeders and leechers. In simple words, seeders are the file distributors whereas leechers are the clients. Choose the one with a higher ratio of seeder as compared to leecher. As the seeder has the entire file and leecher is just another peer who has joined the network to download it, the greater the number of seeders the healthier is the torrent file. This will ensure a greater download speed. BitTorrent protocol is based on peer-to-peer connection. 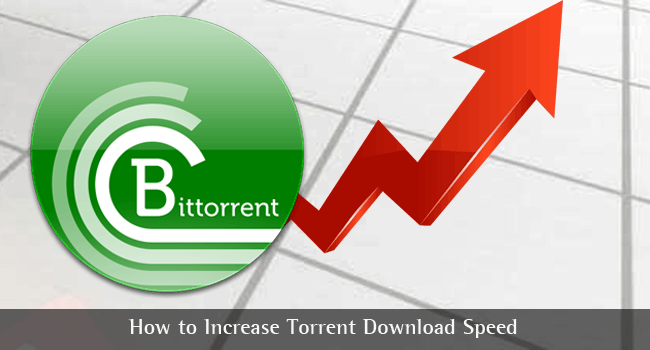 Thus, a higher number of connected peers per torrent prove beneficial in increasing the download speed. 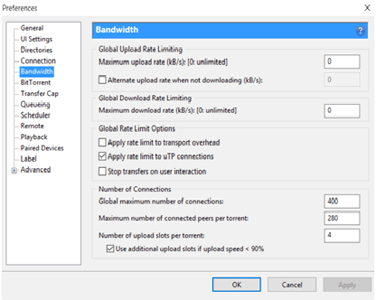 Go to Bandwidth Preferences of your torrent client and look carefully at the ‘Number of Connections’ section. The maximum number of connected peers per torrent should not fall under the extremities i.e. neither extremely high nor low. Hence, upgrade your value from 30% to 40% greater than your upload speed. Consider, for example, your speed is 200 kbps, then you must enter the number value from 260to 280. 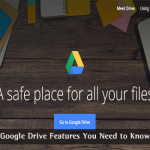 A Torrent file contents may include some unnecessary files such as a Download Information Text Files, System Information Files, Sample AVI Files, Screenshots JPG Files and other subfiles. So, when you add a torrent file to your Torrent Client software, make sure that you uncheck the file contents that are not required. This will save time, bandwidth and even your disk space, though is less amount. Many of the Internet Service Providers (ISPs) are inhibiting BitTorrent traffic on their networks. Consequently, the speed decreases. Enabling your torrent protocol encryption is the best solution for this problem. This enhances privacy and confidentiality and thus, ISPs and other third parties can hardly identify the BitTorrent traffic.in addition, ensure that you have enabled DHT network and local peer discovery. The incoming BitTorrent connections can be blocked by the Firewall. For this, you need to manually configure the Connection settings by adding the Firewall exception. Moreover, right above that, you will find a port number. The BitTorrent protocol port numbers are usually choked up by the ISPs to avoid bandwidth usage in heavy amount, which ultimately reduces the download speed. So, you can set up a random port number which doesn’t fall within specified its range (preferably higher than the range). Typically, the TCP port for BitTorrent traffic is in between6881-6889. So if you are movie buff and face trouble while downloading one from Torrent then you must go with one of the ways we have mentioned to increase torrent download speed. These steps will ensure you keep up with entertainment quotient. It’s certainly a great article, unfortunately, In India lots of torrents sites are blocked by the government. There are certain workarounds like using a proxy or VPN to access torrents. But by using them, the download speed reminds of 2000 when we used to download over a dial-up connection. Thanks, it really helped. I was able to increase my torrent download speed to some extent. I have been using this trick for a long time, by the way thanks for the updated information. Well, getting a perfect port number actually helps a lot. Thanks for the insight though!! Lots of Torrent sites are blocked in India but thanks to VPN that we can access those sites, this is informative guide, thanks for sharing. It is really increased my Torrent Download Speed, thank you such type of posting. Thanks Aishwarya! Have been using torrent for so many years and had no idea about these tricks.